Make this salad with organic corn to obtain a sweeter and fresher flavor. Use a colander with a good grip and stable so you won’t have any accident while cooking. Chop in a very innovative way with the “Norpro Chopping Boards". The magic of these boards is that they are flexible and it is easier to transfer the ingredients. This salad is a delight because the flavor of our 2 main ingredients, the green bean and the corn, is quite similar. Both have a sweet and fresh flavor. By uniting these 2 ingredients the flavors complement and as part of the preparation they are dressed to enhance its flavor . In a very short time you will have on your table a salad that is light and full of flavor. 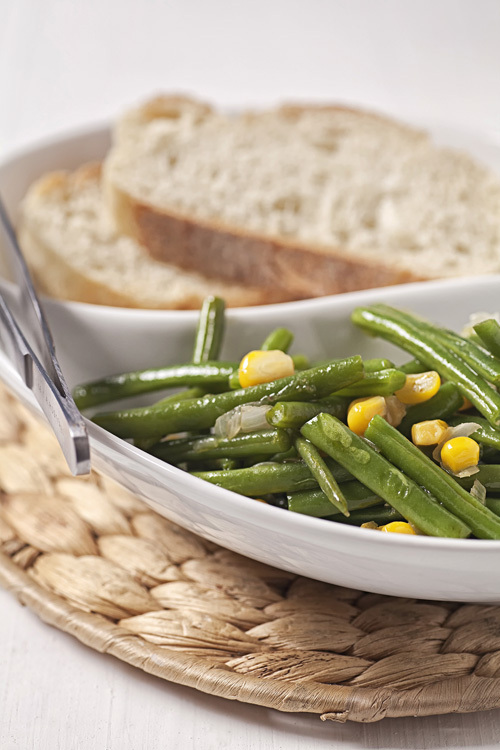 The green bean and corn salad is an exceptional garnish, with which almost any main course can be accompanied . Therefore when you have a main course, to which you want to put a garnish and you don’t know which... think about this salad it is highly likely that it will go very well with your food. The green bean and corn salad is very easy to prepare, only the green beans have to be cooked and then all the ingredients are fried. We recommend using fresh green beans to make this salad because they have a better texture and flavor. If you don’t find them in this way they can also be used frozen or canned. This salad is very versatile because it can be served cold or hot. In this salad golden corn is used and it has to be bought canned. The preparation time is of 20 minutes . This recipe serves 5 portions. If you are using canned green beans, simply cut them into small chunks and go to the stage of “Fry All the Ingredients". Cut the ends of 10.5 oz of green beans. If you are using frozen green beans, it is not needed to cut the ends. Cut into small chunks all the green beans with the ones you worked. The small Green Beans chunks that were cut. The enough Water to cover the green beans. Mix the saucepan ingredients and bring the water to a boil over high heat. Leave the green beans cooking in the boiling water for about 10 minutes, until they soften. Transfer from the saucepan to a colander the small chunks of green beans that were cooked, drain the water excess and reserve. Finely chop 1/4 of an onion, then set aside. Heat in a frying pan over medium heat 1 tablespoon of olive oil. Put in the frying pan the onion that was minced and fry it for approximately 1 minute, until it looks a bit transparent; stir regularly. The small Green Beans chunks that were cooked. 1 cup of canned Golden Corn Kernels. Mix the frying pan ingredients and fry the green bean and corn salad for about 3 minutes, until all the ingredients are lightly fried; stir regularly. Tip: If you want to put one more point of freshness to the salad – sprinkle over it 1 minced coriander sprig. Variation: If you want to taste the corn in another type of salad, prepare the zucchini and corn salad. Did you like the Green Bean Salad?